I’ve been recording audio overnight from the deck here in Essex since August 26 of this year when I purchased a recorder capable of recording all night, a Sound Devices MixPre-6 & Audio-technica BP4025 stereo mic. I start recording around 10pm and generally turn it off at 6am, starting earlier isn’t really an option with all of the traffic noise. This setup will make a Blue Jay calling 500′ away sound like it’s in the yard. I live in a commercial / residential neighborhood with a few good sized lakes close by, a few wet / swampy areas and lots of woods. As we all know there are owls everywhere (well… almost) and apparently around my house in no exception. Prior to starting this little project I’d occasionally hear a Screech / Barred or Great Horned once or twice a year at most. Now a month and a half later I’m finding the Barred Owls call almost any night it’s not raining or windy, rain seems to keep all critters tucked away making for a very quiet night. The Owls may still call on windy nights but I can’t hear it if they do over the wind / leaf noise. I’ve also learned that all three Owls may call together having recorded a Screech calling with a Barred and a Great Horned chiming in, something I was fairly certain wouldn’t happen to keep the smaller Owls from becoming a meal. Here’s a list of the Owls and the dates I’ve recorded them starting on August 26, 2017. I try to record every night barring heavy rain, extremely low temps and high winds. 2017 ended with my visiting Corkscrew Swamp Sanctuary outside of Naples, FL the week before Xmas and then many days and nights with single digit temps and high winds. 2018 started out the same way with the night of January 4th the 1st night worth trying to record. It’s 5 degrees out as I type this on the 6th, we’ll have to wait and see how 2018 progresses for Owls calling in the neighborhood. Loads of other birds and critters as well with Coyotes calling at least a few times each week, foxes barking occasionally and a Cooper’s Hawk “keking” at sunrise almost every morning until today, they nested across the street from the house again this year. This has been a very interesting little project with morning coffee time now being spent scanning the files from the prior night which takes 45 minutes or so using Adobe Audition to view the spectogram where I can “see” the owl / critter calls and skip over the vehicle / plane noise & quiet sections. Here are some of the better (closer to the house) recordings from the last month and a half. Most of the Barred Owl recordings are quite distant but readily recognizable. I plan to continue this project into the winter months, it’s been an eye opener to hear what’s out there most nights! The night of October 13, 2017 was exceptionally quiet with zero wind allowing the mics to pick up the Owls calling around the yard through most of the night with 2 adult and 2 begging young Barred Owls calling off and on. Here’s one of the closer calls. Sunrise on the morning of October 14, 2017 found the local Cooper’s Hawk calling along with a Winter Wrens chatterings. Roosting in one of the nest boxes at 7:30am on 10/19/17. I wonder if this is the Owl that appears to have taken a mouse near the microphone last night? 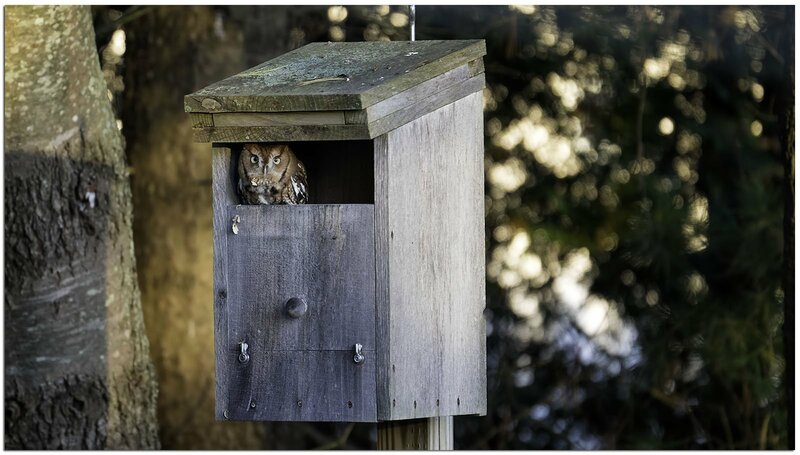 A Screech Owl spent the day in one of the nest boxes in the yard. It’s been quite a while since one has done this nudging me to put the camera in front of the box for a bit of video. Gotta love a cooperative Owl!! This is a great site. Hope you continue to post. I stumbled on this at 2AM the other night when I was listening to 3 different owl calls and was trying to find out the species that were local. I hear a barred owl from my deck or kitchen almost every night. I also find it really interesting you have places around town you look for them. And who knew there could be owls outside CVS. Thanks for the wonderful insight! Phil – this is fantastic. I suspect much hard work is behind these recordings including cleaning up audio, editing, confirming the odd calls, etc. I liked the 10/3 odd Screech call. And learning that all three owls will sing together. Interesting. Thank you for sharing. Also, the first unknown call sounds like a Savannah/Chipping Sparrow (sounds better for Chipping) and the last one is definitely a Chipping Sparrow. Really awesome recording Phil!! Gald to see the mic set up is working out for you. The recordings you are getting sound amazing and have wonderful quality. Keep it up, I’d love to hear more! Thanks for sharing. thanks for sharing Phil! Good to know there are plenty of Owls around. Thinking about Essex Christmas count! I am instantly transported with the click of a button. Thank you for sharing, Phil. This is wonderful. I, like you, was nearly certain that all three owls wouldn’t call together. Now that you have recorded an Eastern- Screech calling along with a Barred and a Great Horned the mystery has been solved. Thanks so much for sharing your experiences & knowledge. I don’t live in the woods and I found these sounds absolutely thrilling. Thanks so much for the patient listening. Phil, this is an amazing project!! Thank you for sharing this. Thank you for these sound files. I live pretty deep in the woods now and can hear owls and coyotes, actually they wake me in the middle of the night. Now I can place a call with the type of animal.